A suspect has been arrested who matches the description of the bomber at a Bangkok shrine, Thailand’s prime minister Prayuth Chan-ocha said Tuesday. The junta boss said the suspect, who is “not Thai,” was apprehended in Sa Kaeo province, on the border with Cambodia. The August 17 bombing of a Bangkok shrine which killed 20 people and wounded more than 100. A few hours before the announcement of the arrest of the alleged bomber, Thailand’s military junta Tuesday called on landlords to help them find those involved with the group responsible for the fatal bombing. The request was made in a noon broadcast aired on all television channels to update the public on the investigation into the attack, which authorities have gone to lengths not to label as an act of terrorism. The junta broadcast also requested owners of residences, guesthouse and apartments “to inform the nearest military or police officers or call 1515” to inform the military or police about any suspicious individuals on their premises. Since Saturday, two apartment complexes have been raided, resulting in the arrest of a 28-year-old foreign man and the seizure of what authorities describe as various explosives and components to make bombs. On Tuesday’s noon broadcast, Army 2nd Lt. Pareya Netrawichien read a statement saying that suspect, whose name and nationality have not been released, yielded information. “The result has proven to be greatly beneficial to the interrogation, leading to [warrants for the] apprehension of additional suspects,” said Pareya, who is also regular newscaster on the Royal Thai Army’s Channel 5 Television. Arrest warrants had been issued for three men and one woman, including the unnamed suspected bomber of the shrine whose image was caught on closed circuit television. The Thai female suspect, said to have rented a room to another suspect, is in another country and is cooperative, according to the military. Media reports quote the chief of her local village as saying Wanna Suansan has been in Turkey for months with her Turkish husband and declared she had no knowledge of the bombing. There has been speculation that the attack could be a response to Thailand’s deportation in July of more than 100 ethnic Uighurs to China. Thai government officials and police have been instructed in their comments not to make any reference to the bombing being an act of international terrorism, nor to mention Turkey nor speculate that Chinese tourists may have been specifically targeted. Eighteen police in Bangkok and six immigration officers in northeastern Thailand have been punished by being removed from their posts for alleged wrongdoing related to the bombing, authorities said on Tuesday. The police officers, following the bombing, failed to conduct ordered searches of premises and “suspicious foreigners” in their districts, falsely claiming they carried out the assignment and discovered nothing unusual, officials told reporters. General Somyot Pumpanmuang, the Thai national police chief, said the six immigration officers had neglected their duties at the Aranyaprathet checkpoint, just across the border from Poipet, Cambodia by allowing “illegal foreign laborers” entry into Thailand. 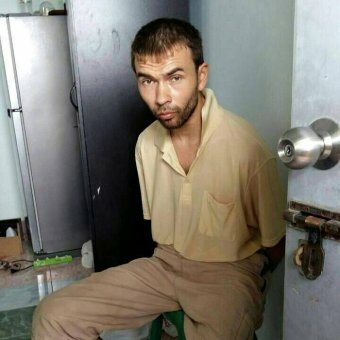 There are local media reports that one suspect captured Saturday, who may have entered Thailand at that location by bribing inspectors, was carrying a fake Turkish passport.